The central air system in your house conditions the air around you by cooling and dehumidifying warm air that is then circulated throughout your house via your network of air ducts that are usually located on the ceiling or floor. You can save yourself energy and money by learning how to maintain the air conditioner yourself. Always follow safety guidelines, like turning off the power before you attempt to repair any problems that your troubleshooting turned up. Dirty ducts and condenser grilles can result in less efficient cooling of your house. The problem with an air conditioner that doesn't kick on is addressed by checking the thermostat setting. Set the thermostat to a colder setting, and, if the unit still won't kick on, go outside to see if the condenser unit is working or not. A faulty compressor can also cause an air conditioner not to start. If the air conditioner repeatedly kicks on and off, see if frost has developed on the evaporator coils located on the inside part of the system. You can solve this problem by running the blower with the air conditioner turned off for a few hours. If frost isn't the cause, the refrigerant is probably low, and you will need to call a professional for a refill. The outside condenser unit can cause your air conditioner to work less effectively when its fan blades cannot operate properly. Look inside the grill to see if a fan blade is obstructed by a limb or a toy. Prune away any limbs, shrubs. weeds, flowers or other vegetation that can result in an object falling into the compressor unit and blocking or hindering the rotary action of the fan blades. If the condenser unit refuses to turn off, the contactor is possibly faulty or just dirty. You can test whether the compresser contactor is faulty with a multitester after first ensuring power to the condenser unit is turned off. Clean the contact points to improve efficiency. If the test proves that the contactor is faulty, replace it by unscrewing the bracket that holds the contactor in place, and replace with a new contractor. "Better Homes and Gardens Big Book of Home How-To" advises an inspection of the blower to determine if it is malfunctioning. Examine the outside condenser unit if your system is suddenly noisier than usual. Troubleshooting a noisy condenser unit may mean unscrewing the lid to take a closer look for a fan blade obstruction, so turn off the power supply. Also inspect the fan blades to ensure they are not hitting the bracket or grille. The authors of "Creative Homeowner's Ultimate Guide to Home Repair and Improvement" recommend lubricating the condenser motor with oil while you inspect the blades for obstruction. A central air system that kicks on but no longer cools the air enough for comfort presents a series of troubleshooting issues according to "Time-Life Fix-It-Yourself: Home Heating and Cooling" Begin by checking that the thermostat is set low enough for the unit to cool the entire house. 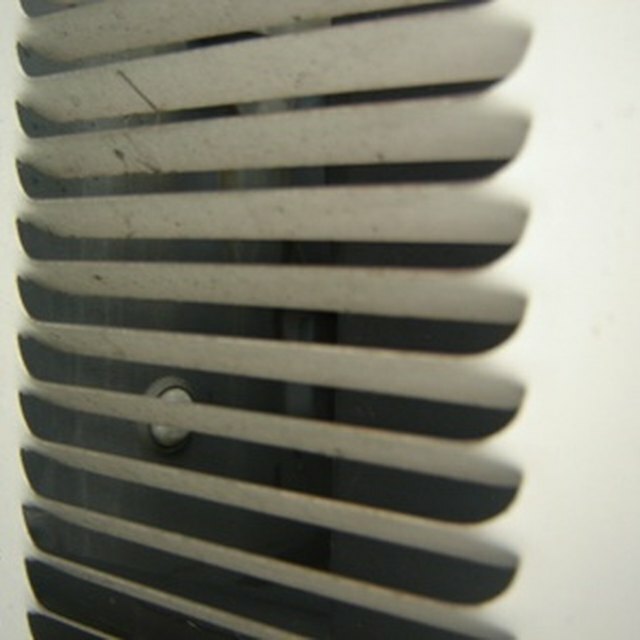 A likely cause for your central air system making the air slightly less cool than usual is a dirty air filter. Regularly change the air filters before they get so dirty that efficiency is affected. Other causes of warmer than wanted air are low refrigerant levels, a tripped high pressure switch and failure of the fan to cool down the condenser coils.